The bushcraft day is aimed at beginners wanting an introduction to bushcraft skills and also those with some basic knowledge wanting to improve their bushcraft skills. 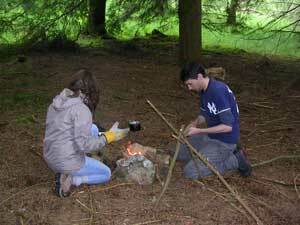 During the bushcraft day you’ll learn the key skills needed to survive: how to build a shelter from natural materials, how to light a fire several different ways in difficult conditions, how to manage a fire and to cook on it, wild food foraging and wild medicines and how to ensure you have a supply of safe water. Shelter is essential in cold and wet conditions. You’ll learn how to build an emergency, one-person, temporary shelter using the natural materials you find around you. Fire lighting is a key survival skill: it warms us, it dries us, it makes water safe to drink, it cooks our food, it lifts morale. Cooking: you’ll find out how to cook on a camp fire, including making supports and hangers to hold cooking pots over the fire and we'll look at sources of wild food. Water: ground water is rarely safe to drink in Britain; we’ll look at some ways of collecting and preparing water to make it safe to drink. Booking: Ring or email to check place availability: tel. 01388 529154 or email enquiries@natureholiday.co.uk then fill in and return the booking form (by email or post) and make your payment by cheque or click on the button below to pay online. The bushcraft day activity leader is qualified through the Institute for Outdoor Learning to teach bushcrafts to groups and has been involved in bushcrafts and teaching woodland skills for more than thirty years. He is DBS cleared.